Palfest in Gaza was fantastic, Susan Abulhawa of “Mornings in Jenin” fame, Lina Attalah former Egyptian Independent journalist and fellow Tahririan, Nora Younis producer of “Reporting a revolution” and Ali Abunimah co-founder of the Electronic Intifada all came to town to do presentations, run workshops, present documentaries and help inspire the already inspirational Palestinian youth activists. Everything from BDS to hasbara to humanizing the Palestinian cause was discussed, debated and argued about. I attended workshops with Ali Abunimah and Susan Abulhawa on the first day of the festival, saw a presentation by Lina Attalah, Susan Abulhawa and Ali Abunimah at al-Aqsa University on the second day and also checked out Nora Younis presenting her film “Reporting a revolution” on the third day. Unfortunately Gaza Ark commitments meant I could not attend the closing concert, which celebrated Palestinian culture old and new, with performances of Dabke through to hip hop. Thank you to all who organised Palfest in Gaza, it helped me get my focus back on the big picture and away from the daily struggles of being part of a rather large international solidarity project. The refurbishment process of the Ark is also moving along nicely, this week has seen sanding of the boat in preparation for the fiberglassing to begin and the removal of the last parts of the winch structure. We are also preparing for the boat to be removed from the water so the major structural work can begin. 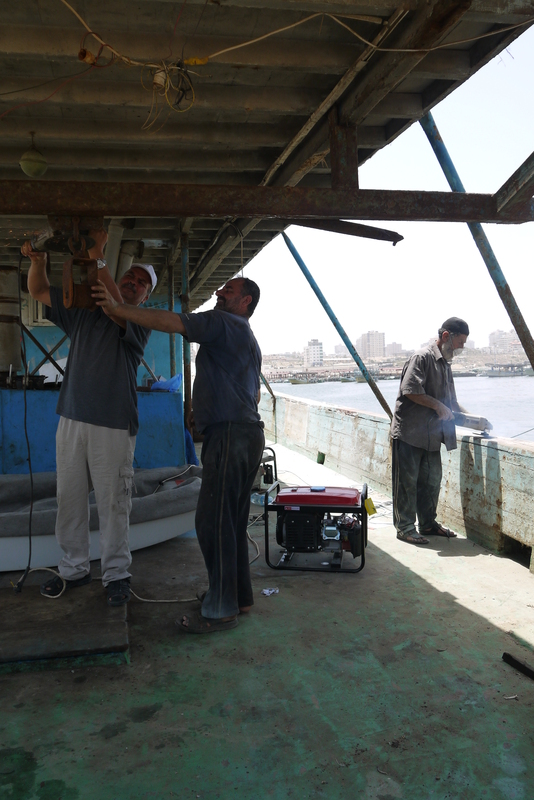 The removal of the boat from the water will also hopefully see the start of filming for the Gaza’s Ark documentary. Everything seems to be starting to come together and while it has been a long difficult process to get to this point, as no one has ever tried to sail from Gaza against the blockade, I am now feeling more confident every day about the success of the Gaza Ark project. Not to mention I now have an even greater appreciation of what the those pioneers in the Free Gaza Movement went through when they attempted to do what no one else had done. I just hope we have the same result as they did back in 2008, but that will not be possible without your support. Go to http://www.gazaark.org and donate and spread the word, Palestinians don’t want hands out they want their freedom ! The Ark refurbishment continuing at pace.